It started with a dog, and then it grew into an institutional tradition. The year 2016 will mark 20 years that Barbara Levy has celebrated the meaning of Thanksgiving Day, bringing an attitude of gratitude — and a big, tasty meal — to those on the Veterinary Health Center duty roster at Mizzou’s College of Veterinary Medicine. Barbara and Ken Levy’s relationship with the University of Missouri College of Veterinary Medicine began when one of their Cavalier King Charles spaniels needed medical care. The Levys have been giving back to the college ever since. Barbara Levy, pictured with her dogs, Nessa and Sophie, came up with the idea of serving dinner to the faculty, staff and students on duty Thanksgiving Day at the Veterinary Health Center. This Thursday marks 20 years of that tradition. The following spring, an idea came to her: That November, she and Ken would show and share Thanksgiving by providing a meal for the faculty, staff and students who spend their holiday handling emergency cases at MU’s VHC. The VHC is open 24 hours a day every day for veterinary emergencies. “They must have thought we were crazy when we showed up that first year and asked for a cart to be brought out front to carry the food into the building,” Levy said with a hearty chuckle. She and Ken prepared the entire home-cooked meal. Confusion may have reigned that first year, but the hungry veterinarians and students were ready and waiting by year three. The Levys were greeted at the hospital door by a medical team with a gurney, ready to roll the food back to the lounge. Barbara Levy’s background may make her especially sympathetic to healthcare professionals working holidays. She graduated from the Jewish Hospital School of Nursing in St. Louis, Missouri, as an RN before earning a business administration degree from Lindenwood College. She retired with more than 30 years of experience in healthcare management and consultation. “They sacrifice their time to care for these animals, instead of having a holiday at home with their families,” she said. One Thanksgiving morning, the Levys had a holiday emergency of their own. Barbara Levy had to rush one of her Cavalier King Charles spaniels to the veterinary hospital. She delivered Mikey to a clinician, promised to return in a few hours, then went home to continue cooking. 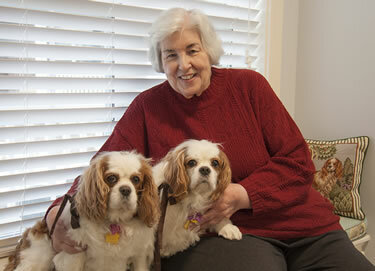 The Levys’ relationship with the VHC began with a dog, a tricolor Cavalier King Charles spaniel named Lady Jane. Cavaliers are susceptible to juvenile cataracts and “dry eye,” but the condition plaguing Lady Jane was something else. “Meeting Dr. Cecil Moore planted the seed for a 30-year relationship with the College of Veterinary Medicine,” Levy said. Moore, DVM, MS, DACVO-Ophthalmology, diagnosed and successfully treated herniated tear ducts. Moore is now a Professor Emeritus in ophthalmology. “They did such a stellar job on her little eye,” Levy said, “that the only problem was the dog was getting better service here” than her husband was receiving in St. Louis, where he was undergoing treatment for eye conditions of his own. The Levys eventually sold their home in St. Louis and moved to Columbia. “We didn’t so much collect Cavalier King Charles spaniels as they collected us,” Levy observed, while Cavaliers number 10 and 11 sat nearby: Nessa, the mother, and Sophie, the daughter. “One of our Cavaliers, Mikey boy, was adopted from the VHC,” Levy recalled. “He came from a puppy-mill situation and required brain surgery. Tony Mann, DVM, MS, DACVS, DACVECC, is a professor of Small Animal Surgery and Small Animal Emergency and Critical Care. Marie Kerl, DVM, MPH, DACVIM – Small Animal Internal Medicine, DACVECC, is a teaching professor in Small Animal Emergency and Critical Care. The Levys’ Cavaliers seem to surpass the breed’s average lifespan. “It’s all because of the great care they receive at the VHC,” Levy said. Another important factor would seem to be an owner who cares deeply and passionately for her pets. Barb Levy has loved 15 dogs through the past 50 years. In addition, she is the author of “Be Your Pet’s Best Friend,”a book published in 2013. The event we know as “The First Thanksgiving” was a one-time affair, not a tradition. It became an official holiday 200 years later. In the years since, Thanksgiving may seem to be disconnected from its historical origins as a public, community-wide sharing of abundant fall harvests. In many American homes, it has become a family gathering focused on a dazzling meal, while the elaborate pomp of parades and the collision physics of professional football play out on television. This year, the Levys’ Thanksgiving for VHC staff becomes a 20-year tradition. And, a holiday meal isn’t the only thing the Levys have shared; the couple has contributed to eye-related research and other programs at the CVM. They have also given generously to nursing and medical programs at the university. That attitude of gratitude is alive and well in Columbia.